Currently viewing the tag: "flu"
Scientists around the world have documented the active properties of pau d’arco and its chemicals including the widely studied chemicals, beta-lapachone and lapachol. This high quality product is a highly concentrated extract of chanca piedra (Phyllanthus niruri). Its Peruvian name, chanca piedra, means “stone breaker” throughout South America and the Amazon. 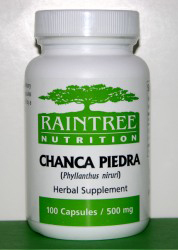 Chanca piedra means “stone breaker” throughout South America and the Amazon. Raintree’s chanca piedra has been sustainably harvested in the Amazon Rainforest and the capsules are 100% pure natural herb without any binders, fillers or additives.